The chart pattern party ain’t over yet! And in today’s intraday charts update, I’ve got a channel on EUR/CHF and a pennant on NZD/CHF. Check ’em out! EUR/CHF has been trading higher for some time now. And if we connect the most recent peaks and troughs, we can see that the pair has been moving higher while inside that there ascending channel. 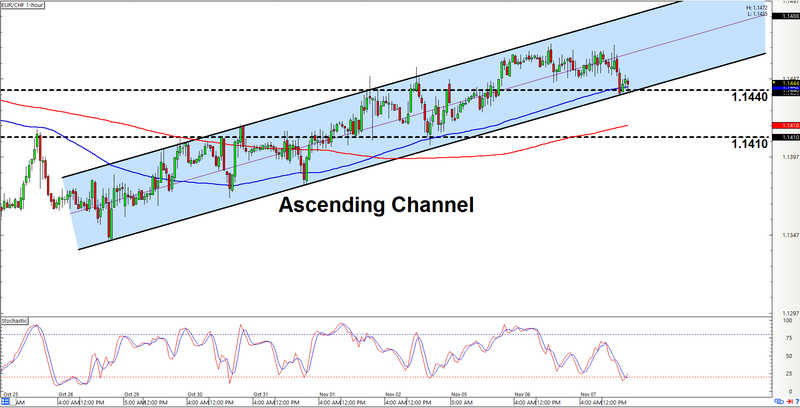 And looking at the chart above, we can see that the pair is currently testing the channel’s support area at 1.1440. Y’all may therefore wanna start lookin’ for opportunities to go long on the pair. And all the more so, given that stochastic is already pointing up after visiting the oversold area. But as always, do keep in mind that there’s always a risk for a downside channel breakout. And if that happens, then y’all may wanna bail yo shorts (or even switch to a bearish bias) if the smashes lower past 1.1410 on strong bearish momentum. If trading breakout setups is more your thing, then heads up ‘coz a bullish pennant appears to have formed on NZD/CHF’s 1-hour forex chart. 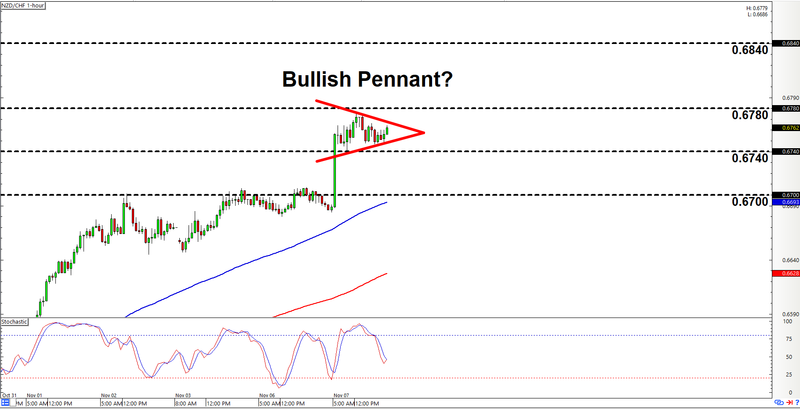 A bullish pennant signals further moves to the upside, so we’re mainly bullish on the pair. And today’s play is to wait for the pair to clear 0.6780, with 0.6840 being the most likely destination, although the pair could potentially move higher past that. Of course, there’s also a slim chance that the pair may break to the downside instead. And if that happens and the pair smashes lower past 0.6740, then likely means that bears are gunning for the 0.6700 major psychological level next.